By FABIO COMANA, M.S., M.A. 1. The true definition of fitness encompasses 10 parameters of physical fitness. The health-related parameters—cardiorespiratory endurance (aerobic capacity), stamina (muscle endurance), strength and flexibility. The skill-related parameters—agility, balance, coordination, speed, power and accuracy. This concept advocates universal scalability, where the same exercises are used for everyone regardless of experience, but scaled by load, intensity (with some accommodation for substitution), rather than by program (stating that “the needs of Olympic athletes and our grandparents differ by degree not kind”). 3. Energy required for all human activity draws upon three energy pathways and true metabolic conditioning targets all three in a balanced and coordinated manner, much like we utilize these systems in life. CrossFit’s general philosophy speaks volumes of truth, but at the same time raises legitimate concerns. The focus of this article, therefore, is not to endorse or oppose CrossFit training, but to highlight key benefits while identifying concerns that merit consideration for individuals participating in these workouts (which are referred to as workouts of the day, or WOD). As is true of all training systems, CrossFit is not perfect or the best, but it does offer an alternative approach to improving fitness that may have potential downsides that need to be considered. You can achieve great results. You may quit because the programming is too difficult. Let’s first examine some of the training benefits this modality can deliver. While CrossFit training aims to prepare participants for the movement challenges of life, there is no question that many people participate for aesthetic reasons (to get themselves in shape and lose weight). With the average American male and female now weighing approximately 195 pounds and 165 pounds respectively, it is worth noting that one can burn an impressive number of calories with these high-intensity workouts. It comes as no surprise to see that women can burn 13–15 kcal/minute (104–120 kcal in an eight-minute circuit) and men can burn 15–18 kcal/minute (120–144 kcal in an eight-minute circuit), plus additional bonus calories during recovery (EPOC) following high-intensity, metabolic workouts. By comparison, traditional machine-based weight training will burn approximately 9 kcal/minute in women and approximately 11 kcal/minute in men (50–55 percent fewer calories). High-intensity, multi-joint movements comprise the bulk of CrossFit exercises, and the overall degree of stress placed upon the entire body will certainly promote systemic neuroendocrine adaptations to improve fitness and one’s overall capacity to tolerate stress (assuming adequate fueling and recovery between sessions). Workouts of the Day (WOD) are given names: female names (e.g., Fran, Angie) for women, and male names for men, including Hero Workouts (e.g., JT, Tommy V, Murph) for those brave soldiers lost in the line of duty. Thank you for your service and sacrifice and kudos to you CrossFit™ for honoring them in this way. I happen to be a fan of simplicity in training, especially in this age of complex exercise equipment, so the notion of utilizing basic movement patterns and simplified equipment holds tremendous appeal. However, I would prefer to see more balance between the three planes of movement as their exercises are generally heavily weighted in the sagittal and frontal planes, with limited choices into the transverse plane, which is the one plane most commonly associated with movement dysfunction (dyskinesis). For those who relish competition, the philosophy of timed circuits, and the practice of recording and publically posting performance scores is certainly a strong motivator. Affiliate CrossFit centers and the Web site post records of best performances for each WOD. Participants can retrieve their daily WOD or opt to choose one of many posted workouts on their Web site; they also have the option to complete the workout on their own or under supervision (with or without some substitution if the WOD is too advanced or challenging). CrossFit workouts are not for the weak at heart, and as some individuals reported when interviewed, the workouts “will wreck you.” While this raises significant concern with respect to technique and injury, it is important to recognize that they do value the importance of safety and this message is evident on their Web site and throughout their training manuals. However, they also acknowledge that in life, individuals face situations that push beyond the limits of appropriate overload where some sacrifices to technique must be made to accomplish the task at hand. They recognize the fact that danger lies in flawed mechanics, but their belief is that flawed technique is the key to making corrections. While this is certainly true for certain aspects of life, I must debate this point when training and designing programs to prepare for life’s challenges. A coach should not attempt to correct poor technique under conditions of high fatigue and load as this only promotes injury. Effectively preparing for the unexpected challenges of the game, mission or life involves careful evaluation of an individual’s skills and abilities, and then progressing task complexity and intensity in an appropriate manner. Once we achieve mastery of the skill, I wholeheartedly agree that we should challenge the body to perform and maintain good technique under the duress of fatigue and load. I subscribe to the notion of teaching someone to paddle and float in the shallow end of the pool prior to pushing them to try to swim (or sink) in the deep end. CrossFit has devoted significant time and energy to educating their coaches. Their CrossFit Level 1™ certificate offers a basic introduction to the fundamentals of CrossFit, and a cursory overview of movement mechanics, while the CrossFit Coach's Prep Course™ is an intermediate-level seminar building upon many of the foundational concepts and movements introduced in the Level 1 Course. While both appear remedial when one considers the nature and risk of the exercises performed, it is the CrossFit Level 2 Trainer™ certificate that goes into greater movement and programming detail, offering comprehensive overviews for teaching movement technique. As an ex-strength coach of Division I university athletes, I found the Level 2 trainer materials consistent with the content needed to train strength coaches on how to instruct athletes to properly perform many Olympic and Power lifts used in various sports-conditioning programs. The Level 1 Trainer Course is under application for accreditation by the American National Standards Institute (ANSI). ANSI, like the NCCA, is recognized under IHRSA’s initiative for accreditation for fitness certifications. Of all the individuals who start and quit an exercise program, 56.2 percent cite program difficulty as the number one reason for quitting. For the average non-athlete, it is crucial that fitness professionals recognize the need to create positive and memorable exercise experiences, as it is the cognitive thought process and emotional responses associated with that experience that drive the decisions and choices to adhere. For new exercisers, this is paramount to promoting adherence and will initially always trump program results; after all, a new exerciser’s initial capacity for exercise is likely to be small, so the probability of seeing noticeable results in the first few weeks is also quite small. When one considers the average male consumes 18,466 calories in a week, even participating in CrossFit’s beginning programs three times per week for 20 minutes will only burn in the range of 650 to 850 calories, a figure that amounts to 3.5 percent to 4.6 percent of total caloric intake. Therefore, it is more important to focus on creating positive experiences, building self-efficacy with manageable tasks and leveraging any positive emotional associations (especially those occurring due to initially changing neuroendocrine responses) to long-term adherence. Although CrossFit does offer beginner workouts, pushing someone to complete a 500m distance on a rowing ergometer as fast as possible on day one may be a little excessive. It is important to understand one fundamental difference between the general public and the athlete or ex-athlete: For those of us with a competitive background who have, at some point, committed ourselves to vigorous training, we often take pleasure in the feeling of being “wrecked” by a training session and view muscle soreness as a positive sign. For this very reason, CrossFit enjoys a cult-like following among athletes, ex-athletes, and those who enjoy competition and tackling an intense challenge. Personally, this is one of the primary reasons I enjoy CrossFit workouts. It takes me back to my college days when, as an athlete, I had to push through our strength and conditioning workouts. However, much of the general public feels compelled to exercise to maintain their health, improve their aesthetics or simply because their doctor has advised them to do so. For them, we need to promote positive experiences, and CrossFit’s high-intensity approach may not be an ideal match. As such, their concept of universal scalability using the same or similar exercises scaled only by load or intensity—“the needs of Olympic athletes and our grandparents differ by degree not kind”—does raise some concern. Ask anyone who opposes the CrossFit philosophy to cite their issues and most will state that people will get hurt. While this is a legitimate concern, one could argue that people get hurt every day performing basic activities of daily living (e.g., bending over to pick up your child). Life throws unexpected challenges at us, and the only real way to minimize the potential for injury it to prepare the body for each and every challenge appropriately. This implies a modality of training where the body moves 3-dimensionally, utilizing every conceivable combination between the planes of motion, combining upper and lower extremities, and the trunk. To some degree, this describes CrossFit training. As mentioned, there are some legitimate concerns with this training approach. 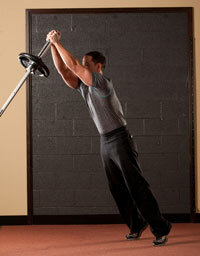 Integrated or multi-joint training places great demands upon the body. Gravity, ground reactive forces, load and momentum are all properties that influence movement efficiency and the stability-mobility relationship throughout the kinetic chain. Any compromise to this relationship will result in movement compensation (dyskinesis) that promotes the potential for injury. Most individuals, whether or not they are an athlete, demonstrate some degree of postural misalignment, muscle imbalance or dyskinesis, and when the demands of high-intensity, integrated movement patterns are placed upon the kinetic chain, the body will turn to faulty neural pathways to be able to perform the movement (Law of Facilitation). Regardless of the degree of exercise instruction used to improve technique, if a coach does not fully understand the principles of solidifying the musculoskeletal foundation (alignment, stability-mobility), then they are simply promoting dysfunction and potential for injury. This becomes exacerbated with high-intensity, complex movements performed ballistically against the clock (achieving maximal repetitions in a specified amount of time). While the Level 2 course covers exercise instruction and some biomechanics, my concern lies with giving trainers who have completed just a few days of training—and without much foundational knowledge into alignment, stability and mobility—the responsibility of supervising form. University strength coaches spend years gaining this level of expertise. Walk into a CrossFit-affiliate center and observe the coaches at work, or visit the Web site and observe many of the videos posted to the site of group workouts. I closely observed form during the exercises performed, especially during the later phases of the WOD circuits when fatigue becomes a factor, and observed dyskinesis in the participants that was not being corrected nor cued by the coaches. I observed, for example, participants demonstrating quad-dominant techniques during squatting, excessive lordosis during the descent of the squat, and an inability to stabilize the scapular-thoracic region during push-ups. While these may not result in an acute injury, they can certainly increase the possibility for chronic (repetitive), overuse (micro-trauma) injuries. The reality is that many of these trainers do not possess the appropriate levels of knowledge commensurate with the complexity of many of the exercises performed. During my most recent visit to a CrossFit facility, I specifically asked the trainer to take me through the basics and to show me how CrossFit accommodates novice exercisers. I was fortunate to work with Trish Davis, a very diligent coach who was cognizant of the needs of a beginning exerciser. Davis led me through a beginner workout with discussion on substitutions. I was impressed with her coaching cues and instruction, and her ability to demonstrate options and progressions. However, I question whether she represents the coaching norm because during that same visit I observed two individuals working with a different coach performing “thrusters” and I was less than impressed with their poor technique and lack of cueing by the coach. While Davis’ skills and proficiencies as a coach where very evident, the menu and intensity I followed was still aggressive to the point where any individual demonstrating some level of dyskinesis would have to compensate to accomplish most of the dynamic movement patterns (warm-up) and exercises. I respect the fact that the CrossFit business model operates on affiliate centers, which makes it a logistical challenge for headquarters to ensure the highest quality of education and coaching at all centers, but if a business plans to deliver such a service, then they must be accountable for due diligence and ensuring the delivery of high-quality training at every location. CrossFit advocates some compromise to create overload, but how does one define the amount of acceptable compromise before the risks of injury outweigh the stimulus of training. To borrow a computer analogy: “Garbage In = Garbage Out.” Energy systems fatigue and we must respect this phenomenon. Instructing individuals to complete as many repetitions as possible (AMRAP) using the same intensity creates an issue, regardless of intent. As fatigue builds, technique will suffer, so at what point do we draw the line in the sand and acknowledge that the risks outweigh the benefits? Asking individuals to know their own limits seldom works in a competitive environment. I subscribe to the 10 percent rule when training novice and intermediate individuals. Any decrement in performance beyond 10 percent = garbage (e.g., reducing the number of repetitions by greater than 10 percent in a given timeframe). You may feel freer to push the envelope, however, with more advanced individuals who demonstrate skill mastery and are cognizant of form even during fatigue states. While I respect the multifaceted approach that CrossFit brings to developing fitness, and firmly believe programs should include exercises and drills for all parameters of physical fitness, I do notice that CrossFit omits reactivity. I realize reactivity would be difficult to train given CrossFit model and available equipment, but it is an important component to one’s overall physical fitness and should be included. After all, reactivity can be the differentiator between falling and not falling as an older adult. Training for speed, agility and quickness may certainly result in slight improvements to reactivity, but these elements are traditionally trained in a closed-skill (pre-determined) environment where the participant is cued and instructed ahead of time. Reactivity is trained in an open-skilled environment where, as in life, the body needs to react to unexpected challenges, threats and stressors. I am a little disappointed with the CrossFit’s nebulous dietary guidelines and subscription to Barry Sears’ Zone Diet. First, this recommendation has to be empirical and not evidence-based as there are several concerns with high-protein, reduced-carbohydrate diets. The 40–30–30 zone (carbohydrates—protein—fat) does not comply with the current USDA Macronutrient guidelines, and contradicts scope of practice recommendations for fitness professionals and coaches. Without proper credentials (R.D., M.D. ), fitness professionals recommending this diet are outside of their acceptable scope of practice. CrossFit training can quickly deplete glycogen stores and, therefore, 40 percent carbohydrate diets are not recommended. In order to metabolize fats into the Kreb’s cycle, the body requires byproducts from carbohydrate metabolism to make this possible. Without adequate carbohydrates, the body turns to glucogenic amino acids (including valuable BCAAs), to manufacture glucose. These are derived from proteins consumed in the diet, but not before they exact a toll on the body by breaking them down or cannibalizing the primary source of storable protein in our body—living tissue (i.e., muscle). High-protein intakes (CrossFit recommends 0.7–1.0 g /lb of body weight) generally place larger stresses on the liver and kidneys to metabolize these amino acids, facilitate dehydration (in clearing urea) and can pull calcium from the bones (to neutralize increased blood acidity from high-protein diets, especially from animal sources). Almost all credible medical and dietary organizations recommend protein intakes for resistance-trained individuals at 0.6–0.8 g/lb body weight and no higher than 0.91 g /lb of body weight. Making a recommendation to avoid high-glycemic carbohydrates at all times makes no sense. During exercise, when under the influence of the sympathetic nervous system, insulin release is naturally suppressed while cell receptor sensitivity increases to facilitate glucose uptake into cells. When glucose is needed by the muscle cells (during exercise and early recovery to fuel and regenerate glycogen), high-glycemic carbohydrates are good choices. In closing, I would like to reiterate the objective of this article. While I personally enjoy CrossFit workouts, there are both benefits and concerns to this method of training, and my goal was to increase awareness of both sides of the argument. If you seek a multi-faceted, challenging workout that will prepare you for life’s challenges, and allow you to savor some good old muscle soreness, I would encourage you to consider CrossFit. However, as fitness professionals you must consider the risks and ramifications this form of training can have upon your clients. With that said, I invite you ladies to tackle Fran or Angie, and gents, give Tommy V or Murph a try. Fabio Comana, M.A., M.S., is an exercise physiologist and spokesperson for the American Council on Exercise, and faculty at San Diego State University (SDSU) and the University of California San Diego (UCSD), teaching courses in exercise science and nutrition. He holds two master’s degrees, one in exercise physiology and one in nutrition, as well as certifications through ACE, ACSM, NSCA, and ISSN. Q and A: What’s the Best Way to Get Acclimated to Hot Yoga Classes? From multiple opportunities to interact with top fitness industry leaders while earning nearly all of your CECs toward certification renewal, to the vast array of San Diego’s must-see hot spots, discover the top 10 reasons why fitness professionals nationwide will be in San Diego November 3–6. To expand ACE’s reach to consumers and provide you with safe and effective resources for your clients, we created the ACE Get Fit initiative – a program that informs, educates and motivates people to lead healthier, more active lifestyles. View our video and pass it along! This new 2-day workshop for personal trainers of all levels delivers not only the latest in assessment and programming, but also business strategies, balance and the core, weight management, communication, and the behavioral and emotional components needed to empower clients toward long-term change.